Hi all, first post so if in the wrong forum area please move! I am with AOL and have always used the original Voyager 105 USB modem they supplied donkeys years ago (yes, I'm sure utterly outdated but the connection has never failed through it and the speed offers all I need for my purposes). However, due to family situation I need to ideally now share the connection with a separate PC to mine and so am facing creating a wireless network (my AOL account is apparently "AOL Wireless" despite me never requesting such). I assume it's impossible to retain my wired connection while also allowing another PC to use a wireless connection? (due to the size of house both PC couldn't be physically wired to the same router/modem without an unwanted trail of cables and much drilling anyway). Security wise I've always preferred wired but am now resigned to having to go to wireless I guess. 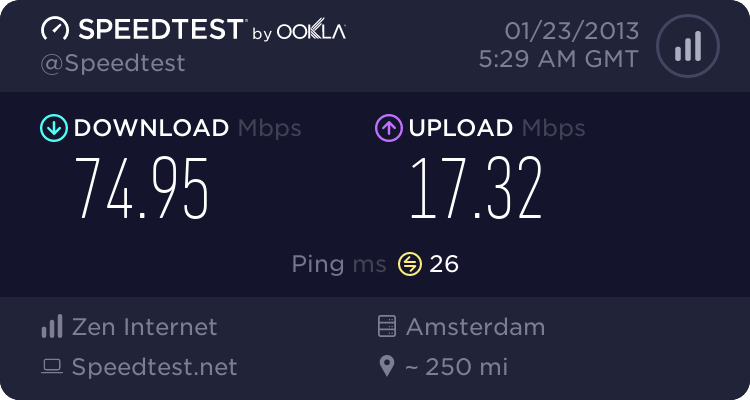 If so, what would be the best way to set up such - somewhat of a novice here - and which is the best wireless router speed/connection wise for the AOL network (which apparently uses the same infrastructure as Talktalk?). I'm interested to know from others experience, how much hassle is involved in such a process? Ideally I don't want to contact AOL about any aspect of this as my contract has lapsed and I'm simply on a month by month situation (at a reasonable enough price) and don't really want to have to call their useless customer support which they seem to take as the catalyst to put you under a new contract. I run my system without any AOL software on PC, just using the login to make a connection in XP settings. The other PC is a win7 though, but I would like to also create the connection there similarly. Should that be ok? I have considered other ISPs given the change in connection but I do like my current plan with unlimited downloading and a decent enough speed for all I ask. You need a wireless router instead of the USB modem to do this. Tell AOL to meet that promise and send you a wireless router instead of that outdated USB modem. At one time AOL were sending out Netware DG834G routers which were perfectly adequate; now probably they supply newer N-wireless routers. EDIT: Are you on the AOL 8 Meg or 20 Meg package? Can you get the modem stats? the AOL network (which apparently uses the same infrastructure as Talktalk?). Apparently, but they package & manage their products differently. Hi sinfony, and welcome to the thinkbroadband forums. You cannot have two DSL devices connected at the same time, so you will have to replace your USB modem with something else. Seeing as you want wireless, the obvious answer is to install a ADSL2+ 802.11n wireless router. This does three things - connects to your Internet provider using your DSL line, shares the connection over a handful of Ethernet ports and acts as a wireless base station. ADSL2+ equipment supports all flavours of ADSL used in the UK, so if your connection is upgraded to use an 'up to 24Mbps' connection (now advertised as 'up to 16Mbps' to avoid incurring the wrath of the advertising standards people), your equipment will be ready. 802.11n is the latest ratified wireless standard. If your computer has a wired Ethernet port, you just need a cable to connect the router and computer - you will probably get one with the router (and will need one to set the router up). If your computer lacks a wired Ethernet port, you will need to install an inexpensive network card inside it. The Device Manager in Windows may help if you are not sure - look under Network Adapters. A glance at the back of the computer may also help - you're looking for something similar to but wider than the socket used to connect your Voyager to the phone line, which will have 8 wires in the hole. Your computers will see the Internet connection as via a network, so there's no user name and password to enter on each computer, though the wireless computer will need details of your wireless security setting entering. The AOL user name and password go into the router, along with a handful of other settings about your AOL connection (which you may be able to read out of the Voyager settings or find on the AOL web site, as they will be generic rather than account specific). I believe AOL will use PPPoA, so, alongside that, you will need to configure VPI (probably 0), VCI (probably 38), encapsulation (probably VC) and the user name and password you currently use with the Voyager. No UK ISP uses ATM quality of service - if the router asks you to set that, just choose UBR. The settings on an individual router may look slightly different to this - just choose the closest. If you get the settings wrong, the router won't connect. You can configure the router initially with it connected to your computer via an Ethernet cable. When you think you have the settings correct, hook it up to your phone line in place of the Voyager modem. If the router doesn't connect to the Internet and you can't figure it out, simply disconnect the router and return to the Voyager modem temporarily. I presume the Windows 7 computer has built in wireless - I'm assuming it is a laptop. If not, you will need wireless hardware for it - usually these come in the form of a USB stick. I'm a little out of touch as to what is available in consumer routers - my home network is made up of business grade gear as our requirements are more demanding than most. I have bought networking gear from Broadband Buyer, who are local to me - I have no connection other than as a satisfied customer. In addition to seeing what others recommend and reviewing Broadband Buyer's list of ADSL2+ 802.11n wireless routers (biasing your search towards the cheaper end - your requirements are modest so there's no 'added value' from more expensive gear), I'd consider giving them a ring and seeing what they'd recommend - they're on a geographic phone number. If nothing else, Broadband Buyer will provide another data point. For wireless security, make sure you disable WPS (sometimes called one-button setup) as it has security issues and use WPA2-Personal (may be called WPA2-PSK) with a 63 character long random password to prevent hackers from mounting a 'dictionary attack' (where they try combinations one at a time). It may be a pain to enter, but you only have to do it once per wireless device and you can always copy and paste it from a text file on a USB memory stick. To start with, I'd concentrate on getting the wired computer working with a router - you can configure the wireless part of the router to 'disabled'. You can treat the wireless setup as a separate project. I hope this is a helpful start. If you identify a router of interest you can go to the manufacturer's web site and download the manual. Hopefully, when put together with the information in this post, you can make sense of it. I've received a private message from another forum user criticising the length of my earlier reply and the amount of detail in it. sinfony - I hoped I'd provided the correct balance between saying enough to get you started on figuring out your way ahead (plus some information about wireless security) and not writing too much or making you feel even more daunted. If I've overfaced you, bored you or have covered areas that you understood anyway, please ignore everything I wrote. Hi and thanks for the detailed response - the more information the better as far as I'm concerned. I will start looking around for a decent router - and my instinct is I am also lacking an ethernet port on my PC (it's already 7-8 years old). A little extra details: My AOL connection - which is (supposedly) 8meg - via the USB modem uses PPPoE; and the win7 system is actually also a PC, not laptop. An Ethernet card costs very little. My personal favourites are Intel cards, but they tend to be the most expensive. Anything that is PCI rather than PCI Express (sometimes written as PCI-E) will do. At Broadband Buyer, a TP-LINK card is available for £6.95, whilst the Intel equivalent is £22.96. You can get used cards from eBay for pence - though with new cards being so cheap, I'd say it's hardly worth taking a risk. On the other hand, it's not worth spending much money on such old hardware. Windows XP is now into its extended support phase, so I'd be making plans to upgrade in the next year or so. A very modest and inexpensive modern desktop machine will comfortably outperform something that is 7-8 years old. The Windows 7 machine could have any combination of PCI Express and PCI slots - if you decide to go for an internal card, it's best to take the lid off and check before ordering. Usually - but not always - PCI Express slots are black whilst PCI slots are cream. You can put a short PCI Express x1 card like a wireless adapter in a longer PCI Express slot if that's all you have. The alternative to an internal wireless card is a USB adapter. Again, Broadband Buyer has internal cards and USB adapters. I'd be surprised if the USB modem is actually using PPPoE over the line, though it could conceivably appear in Windows as PPPoE. I'd configure the router as PPPoA first, as I described in my first post. You can always try PPPoE if PPPoA doesn't work. If a desktop PC even most ones of 7 to 8 years age had an Ethernet adapter, but failing that you can add an extra card or go the simpler option such as a USB Ethernet adapter. Routers like the Netgear DG834G have been popular with AOL in the past, and they may send one out if you ask, just check if they want to charge P&P, or whether it will mean a new 12 month contract. Below are the essential settings that AOL Broadband uses to set up broadband routers. All our broadband packages come with a free wireless router. But with this package you can also upgrade to a router using the latest 'N' technology. For a bigger wireless range and faster connection speeds, you can make the most of your AOL Broadband.